Today's Hours: 10 a.m. - 3 p.m. Supporting all departments and disciplines. Working along with all R&I Librarians to support Division and Department needs. Everyone, except convicted book thieves. Actually, scratch that, convicted book thieves are welcome, too. We’ll assume the best of you and hope your thieving days are behind you. Everyone is welcome to use the library building and online library services while on campus. Borrowing materials is limited to current members of the Macalester community and people with neighbor cards. Accessing online research databases when away from campus is limited to the current Macalester community. We have circulation policies to help you figure out the details of who can borrow what. See the college events calendar for any changes. So, do librarians just look at books all day? Meh. For us, it’s really about how information operates within society and helping you access and use it. Yeah, books are cool, but so are stone tablets, cassette tapes, cloud-based storage systems, and brains. Especially brains. We like brains. So, if you don't read all day, what do people who work at libraries do? Thanks for asking. We do so many things. We have staff that work with managing our collections (our physical and digital ones). They keep everything organized and discoverable from the point an order is placed to decades after it has been set on our shelves. Changes are constantly being made to how you discover and access our collection. We also have staff who make sure the circulation of our materials amongst people at Macalester and between other libraries goes smoothly. There are others who are teachers who help students develop their research and information skills. We also are publishers. We curate Macalester’s history. All of these services relate to one another and we do them all by the entire library staff working closely together. We also frequently do things beyond Macalester such as presenting at conferences, working on projects with librarians at other institutions, and focusing on issues such as free speech and open access. Where are the quiet study spaces? Shhhhhhhh! Just kidding, we don’t shush anyone. We expect, and hope, your library will be a lively space. However, if you do seek quiet there are study rooms (group and individual) available on the 2nd, 3rd, and 4th floors. Also, the 4th floor as a whole has a quiet policy and you can expect to not be disrupted by noise there. Is it true swallowed gum stays in your stomach for 7 years? We have no clue. Have you tried searching the internet? We believe in helping people find accurate information. We also believe in taking effort to make sure less-emphasized voices are heard. We also support the Library Bill Of Rights, published by the American Library Association. What’s your opinion? Does this mean neutrality? Yeah, this is our most frequently asked question, but we’re not answering it here. Come on over to the library and ask us this in person and we will be happy to direct you to our non-gendered and gendered bathrooms. Can you extend the checkout time for my laptop? We lied. This is our most frequently asked question, more than bathroom locations. The answer: Frequently yes, but sometimes no if there are not several other laptops available for others to check-out. We also allow you to renew the check-out period on books. See our full circulation policies. How do I request for the library to add a book to its collection? Faculty and staff in academic departments have access to our Oasis ordering system which should be used for most of their orders. If you don’t work in an academic department you can try this form or just ask any library staff member – we’re very nice. We, in most cases, do not accept donations, but you can read our full collection policy, including the part about donations. How do I get awesome research skills? Practice and time. Have an open mind while, at the same time, thinking critically. 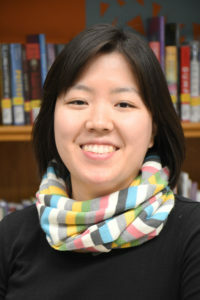 Talk to a Research & Instruction Librarian (see our smiling faces above), they love helping you hone your research skills. Use research guides. Search for sources in our databases. Be inquisitive and question assumptions. What's the weirdest thing in your collection? Weirdness is in the eye of the beholder. We do have How To Become A Supple Leopard, The Art Of Being A Parasite, Roar, and a moose puppet – and those are just a few lifeforms. We also have several books, journals, and movies about cheese. You can also find picnic blankets, laptops, a poster case, dongles, and much more.